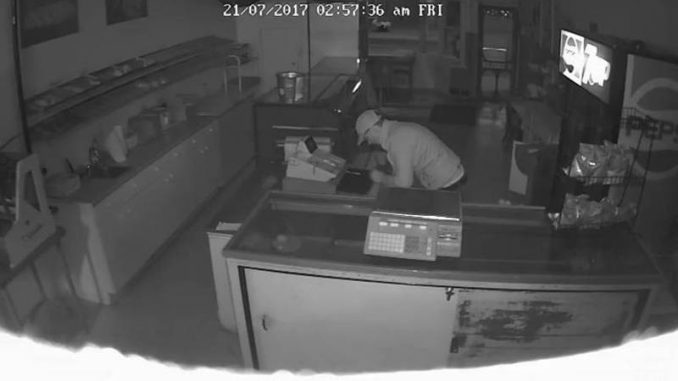 CORNWALL – City police are hoping you can identify a late night thief, caught on camera in a downtown bakery. Police say the break-in happened Friday (July 21) around 2:50 a.m. at Riley’s Bakery on Pitt Street. The suspect can been seen on camera going through the cash register and police tell Cornwall Newswatch an undisclosed amount of money was taken. Police are not releasing the video, adding that the still image from the camera is the best piece of evidence in their investigation. The suspect is described as white with a thin build, about 5-foot-10 and was wearing jeans, a jacket and ball cap. He also walks with “a funny shuffle,” police said. Anyone with information is asked to call Const. Patrick Collins at 613-933-5000 extension 2973. This is not the first time the popular city eatery has been targeted by thieves. In December 2016, an ATM was stolen from the bakery.